In 1937, there was debate to build the new VA Hospital on the grounds of Southwestern Medical Foundation. After the City of Dallas won over 8 other Texas cities competing for a VA facility, construction began in 1937 on the $1,250,000 hospital. With 200 employees on board, the first patient was admitted on Aug. 19, 1940. At the time it was built, the area was a corporate entity known as Lisbon. For years, the hospital was known as the Lisbon VA. The hospital's formal dedication took place on Sunday, Oct. 27, 1940. The hospital sat on 244.82 acres and the grounds included housing for managers, nurses, attendants, and officers. The annual payroll was $300,000. In 1944, the bed capacity increased to 300. Staff on Jun. 19, 1945 included 18 doctors, 1 dentist, 32 graduate nurses, 56 attendants, 36 kitchen workers, and about 200 clerical and groundskeepers. Construction of Building 2, the Laundry, and the duplex cost $8,500,000. In Aug. 1955, patients moved into Building 2 and Building 1 was closed for renovations. The 7th Floor of Building 2 had a solarium and a sun porch; each ward had a recreation room. Each inpatient had earphones for radio programs or music selections the the hospital’s electronic center. The hospital had 9 operating rooms; 6 with closed circuit television for viewing surgical practices. There was a Dining Hall for 200 ambulatory and wheelchair patients, and a warming kitchen on each floor. The top 2 floors were designated for neuropsychiatric patients and had private bedrooms and individual baths. 1958-1961 were called the "Growing Years" because medical beds grew from 255 to 700. McKinney VA Hospital closed in 1965. The Central Dental Lab opened in 1971; one of only 4 in the entire VA system and now, one of 2 labs. The hospital was air conditioned in 1972. In 1985, the Privacy Project renovated a 16-bed ward into 2 and 3-bed rooms. Dallas VA has 4 Middleton Awardees for Research: Dr. Roger Unger, MD; Paul Srere, PhD; Sami Said MD; and Kosaku Uyeda, PhD. Today’s Veterans Health Administration (VHA) originated during the Civil War as the first federal hospitals and domiciliaries ever established for the nation’s volunteer military forces. 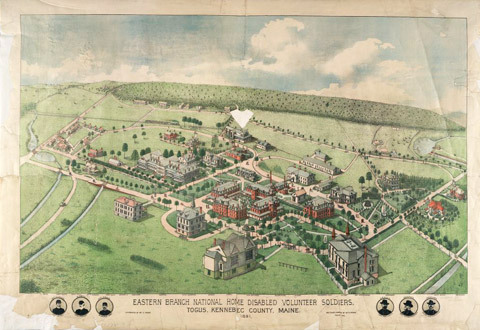 Eastern Branch National Home for Disabled Volunteer Soldiers in Togus, Maine, 1891. On March 3, 1865, a month before the Civil War ended, President Abraham Lincoln authorized the first-ever national soldiers’ and sailors’ asylum to provide medical and convalescent care for discharged members of the Union Army and Navy volunteer forces. The asylum was the first of its kind in the world to provide civilian medical care to Veterans of temporary volunteer forces. Two earlier soldiers’ homes, operated by the U.S. Army and Navy for Veterans of the Regular military forces, were very small and housed only up to 300 men each. The National Homes housed ten of thousands of Veterans. The National Homes were often called “soldiers’ homes” or “military homes.” Initially only Civil War soldiers and sailors who served honorably with the Union forces—including U.S. Colored Troops—were eligible for admittance. The first National Home, now VA’s oldest hospital, opened near Augusta, Maine, on November 1, 1866. They provided medical care and long-term housing for thousands of Civil War Veterans. Many programs and processes begun at the National Homes continue at VHA today. They were the first to accept women Veterans for medical care and hospitalization beginning in 1923. By 1929, the National Homes had grown to 11 institutions that spanned the country. All of the original National Homes have operated continuously since they opened. 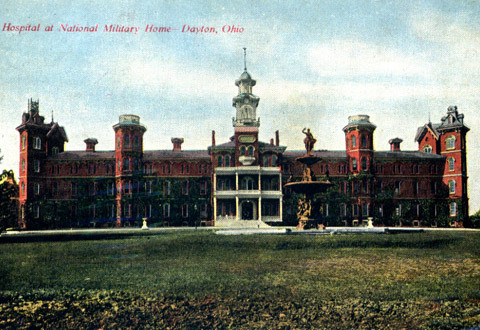 Hospital, Central Branch, National Home for Disabled Volunteer Soldiers, Dayton, Ohio, 1912. For nearly five years three separate federal programs, two of which were under the Treasury Department, provided benefits exclusively to World War I Veterans. In 1921, the Bureau of War Risk Insurance, Public Health Service Veterans’ hospitals, and Rehabilitation Division of the Federal Board of Vocational Education were consolidated to form one agency. 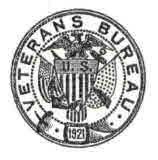 On August 9, 1921, Congress created the Veterans Bureau by combining three World War I Veterans programs into one bureau. 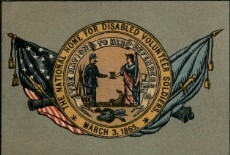 The Veterans Bureau and National Home for Disabled Volunteer Soldiers worked cooperatively to provide medical care to all Veterans at this time. World War I was the first fully mechanized war and soldiers exposed to mustard gas and other chemicals required specialized care. Tuberculosis and neuro-psychiatric hospitals opened to accommodate Veterans with respiratory or mental health problems. Native Americans who served in World War I were authorized, for the first time in history, to apply for American citizenship due to a law enacted on November 6, 1919, making them eligible for full Veterans benefits, including health care. The first segregated federal Veterans hospital opened under the Veterans Bureau on February 12, 1923, in Tuskegee, Alabama. In 1924, Veterans’ benefits were liberalized for the second time in history to cover disabilities that were not service-related. In 1928, admission to Veterans Bureau hospitals and National Homes was fully extended to women, National Guard, and militia Veterans. The second consolidation of federal Veterans programs took place on July 21, 1930 when President Herbert Hoover consolidated the Veterans Bureau with the National Home for Disabled Volunteer Soldiers and Pension Bureau and re-designated it as the Veterans Administration. General Frank Hines, Director of the Veterans Bureau since 1923, became the first Administrator of the VA. His tenure lasted 22 years and ended in 1945 when General Omar Bradley took the helm. In 1930, VA consisted of 45 hospitals. By 1945, the number had more than doubled to 97. World War II ushered in a new era of expanded Veterans’ benefits through the Servicemen’s Readjustment Act of 1944, commonly referred to as the “G.I. bill", which was signed into law on June 22, 1944. General Omar Bradley took the reins at VA in 1945 and steered its transformation into a modern organization. In 1946, the Department of Medicine and Surgery was established within VA. VA was able to recruit and retain top medical personnel by modifying the Civil Service system. The first women doctors were hired in 1946. When Bradley left in 1947, there were 125 VA hospitals. Dr. Paul Magnuson, a VA orthopedic surgeon and Chief Medical Director, 1948-1951, led the charge to create an affiliation program with America’s medical schools for medical research and training purposes. By 1948, 60 medical schools were affiliated with VA hospitals. Over the years, these collaborations resulted in groundbreaking advances in medicine, nursing, medical research, and prosthetics. In the post-World War II period, 90 new and replacement Veterans hospitals were planned, but many were later shelved, when VA’s budget was cut to help fund U.S. Cold War programs. During the 1950s VA’s cooperative research studies led to discoveries about cancer, diabetes, chemotherapy, nuclear medicine, and helped to diminish the spread of tuberculosis. The first-ever successful human liver transplant operation took place at the Denver VA Medical Center in May 1963 under Dr. Thomas Starzl. In 1977, two VA doctors, Dr. Rosalyn Yalow (Bronx VAMC) and Dr. Andrew Schally (New Orleans VAMC) received the Nobel Prize in Physiology or Medicine for their work in developing radioimmunoassay of peptide hormones. Dr. Ferid Murad (Palo Alto VAMC) received a Nobel Prize in 1998 for his discoveries concerning nitric oxide as a signaling molecule in the cardiovascular system. Many modern medical advances originated as trials or experiments in VA hospitals and now benefit patients of all types worldwide. 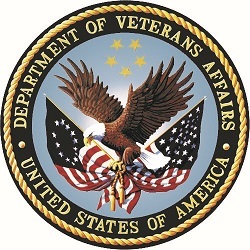 VA’s Department of Medicine and Surgery was re-designated as the Veterans Health Services and Research Administration, as part of the elevation, and on May 7, 1991, was renamed as the Veterans Health Administration (VHA). 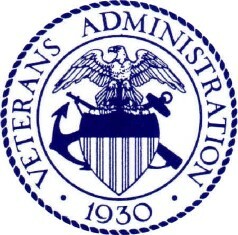 The Veterans Health Administration (VHA) is the largest of three administrations that comprise the U.S. Department of Veterans Affairs. VHA’s primary mission is to provide medical care and services to America’s military Veterans. VHA operates one of the largest health care systems in the world and provides training for a majority of America’s medical, nursing, and allied health professionals. Roughly 60% of all medical residents obtain a portion of their training at VA hospitals and our medical research programs benefit society at-large. Today’s VHA has roots spanning over 150 years and continues to meet Veterans’ changing medical, surgical, and quality of life needs. New programs provide treatment for traumatic brain injuries, post-traumatic stress disorder, suicide prevention, women Veterans, and more. In recent years VHA has opened more outpatient clinics, established telemedicine, vet centers, and suicide prevention hotlines, and developed other services to accommodate a diverse and ever-changing Veteran population. VHA continually evolves and cultivates on-going cutting-edge medical research and innovation to improve the lives of America’s patriots.